MONDAYS: Edmonton Primary School Hall, School Road, Te Atatu South, Auckland. TUESDAYS: Rutherford Primary School Hall, Te Atatu Peninsula, Auckland. WEDNESDAYS: St Annes Hall, Beach Road, Browns Bay, Auckland. THURSDAYS: Massey University Recreation Centre, Albany, Auckland. Welcome to Ceroc Dance NorWest the home of Ceroc West Auckland, Albany and North Shore. Ceroc Dance is taught by NZ dance champs, Nikita Grindle & Ross Craigie. They are both experienced teachers with a relaxed, friendly style making for fun and easy to learn dance classes. Ceroc® Dance modern jive is a social partner dance generally done to chart toppers and old favourites. It is a partner dance that you can dance at parties, pubs, nightclubs, weddings; just about anywhere! Ceroc Dance is likened to a fusion of Salsa and Jive but also draws on Latin, Ballroom, Swing and West Coast influences, and does not have complicated footwork. Start any time, no bookings, experience or partner required. 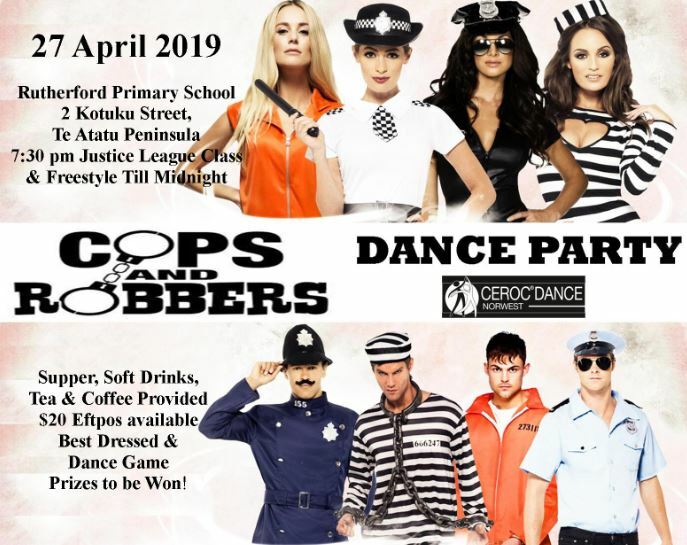 Tuesday: iCeroc Rutherford Primary School, 2 Kotuku Street, Te Atatu Peninsula. Wednesdays: St Annes Hall, 756 Beach Road, Browns Bay (Corner of Beach & Glencoe Roads). Thursdays: Massey University Recreation Centre, 1 University Ave, Gate 1 Massey University, Albany Express Way (State Highway 17). Refer to the above calendar for classes and times. Various Concession Cards, 3 & 6 month memberships available. Eftpos available on all nights. Privates, Wedding dance lessons and Workshops available. Ceroc West Auckland is on Facebook under Modern Jive Dance, like us. Dance Parties held every month. For further details refer Ceroc Events. 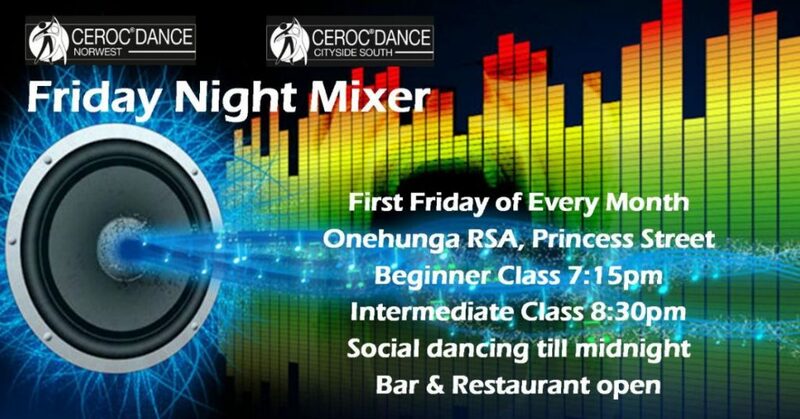 Onehunga RSA, 57 Princes St, Onehunga. Bar open & extended freestyle to midnight.